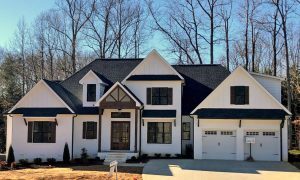 When you’re deciding on one of the many custom home builders in NC to build your dream home part of the appeal is being able to customize your home for your lifestyle and taste. There is a huge range of options for people who want a custom home, but when it comes to really pulling together a unique and personal style that will make your home feel like it was designed just for you, the details are what matter. The flooring that you choose really sets the tone of your home. From dark luxe hardwoods to sunny low-maintenance laminates, customizing your flooring is one finishing touch that will define the look of your home. With so many beautiful and practically maintenance free flooring options in a wide range of prices it will be easy to find a color and material that will give your home the function that you need while defining your unique personal style. One of the best ways to customize your home is to have custom cabinetry created. No home can have too much storage, but a custom home allows you to put custom storage where it makes sense for you and your lifestyle. You might choose to have custom storage and cabinetry put in the playroom so that your kids can have plenty of space to store their toys, or you might want a totally customized storage system built into your master bedroom closet to suit your style and accommodate your favorite wardrobe items like shoes, ties, or hats. 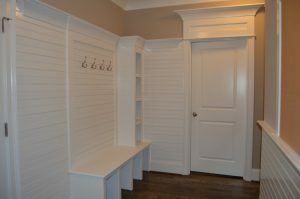 Consider having some custom cabinetry built into the mudroom so that each person in the family has a designated place to put their shoes, coats, backpacks, and other items. You can work with your custom home designer to have storage and cabinetry built into any part of the home. Don’t forget to choose custom hardware for those cabinets as well. Small details like cabinetry hardware and crown molding have a big impact on the style of a home. Another finishing touch that personalizes your custom home is the lighting fixtures that you choose. From track lighting to under cabinet lighting, there are lots of options for built–in lighting that will give you additional function in your home. And lighting fixtures such as farmhouse style lighting or industrial light fixtures can give your new custom home a unique style that will be all yours. Smart lighting is also a very on–trend finish for this year. Nothing makes custom homes more unique than one of a kind reclaimed materials used throughout the home. 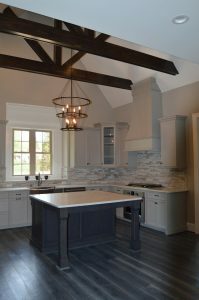 When you have a custom home built you can use unique reclaimed doors, barn wood flooring, wood beams, and other items to make your home as unique as you are. Reusing old front doors from vintage homes or installing vintage barn doors in places like the bathroom, mudroom, or laundry room is a fun way to make your home really stand out. You can also have reclaimed wood used as molding or wainscoting in the home to give it a more personal touch. If you choose one of the top custom home builders in NC, they should always be willing to work with you and incorporate repurposed materials into your home. If you want to see a range of custom finishes and design elements that can make your home truly reflect your personal style give the team at R & K Custom Homes a call today to talk with a home design expert. Whenever you are looking for a new home, that home has to have the functionality necessary to make life easier for you and your family. Buying an existing home usually means that you’re going to have to trade some function in order to get something else on your must-have list. For example, if you want an extra bedroom or a finished basement multipurpose space, you may have to accept a home that doesn’t have the mudroom you want or an open concept made for entertaining. When you have a custom home built you can select a home that has all the functionality you and your family need so that you can alleviate pressure and stress in your life. A custom-built home allows you to create a unique home that is customized specifically to provide the function that you and your family need. Another factor to consider when you are choosing between buying an existing home or having a custom home built is the features that are available and the features that you want your home to have. Older homes that weren’t built for modern life may not fit aspects of the lifestyle you want to have. If you buy an existing home you may have to renovate and make changes to that home to get those high-end features that you want. Having a custom home built gives you the opportunity to have lifestyle spaces like indoor/outdoor kitchen and dining spaces, home gyms, or guest suites incorporated into the design of the home from the start so that the house has all of the lifestyle upgrades that you want in a new home. There are existing homes that have a lot of charm and might seem like they would work for your family right now. But your home should be designed to take your family into the future, not just to suit your lifestyle right now. A new home with smart technology, energy efficient design and appliances, and modern building materials is the home that will take your family into the future. To find out more about the options that a custom-built home gives you call R&K Custom Homes today. 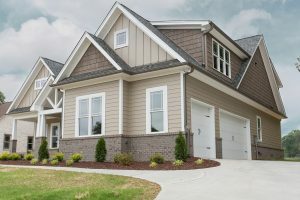 Smart home security systems are already one of the most popular new features that Greensboro builders are being asked to consider in custom built homes. Everything from smart cameras that can record crystal clear images of the outside of the home to smart locks that can be locked and unlocked with a phone app or even face and fingerprint recognition are making homes more secure and giving homeowners more flexibility when it comes to home security. Automation in the kitchen is making it easier to entertain in addition to getting everyone around the dinner table at the end of the day. Smart ovens can start preheating when you’re on your way home from work and tell you when your turkey is done so you don’t have to wonder. Smart refrigerators can scan the inside of your fridge and send you a text message when you’re running low on milk or other staples. And with smart plugs, you can turn any appliance into a smart appliance that you can control with an app or even with your voice. Thanks to networked AI devices, homes may no longer need separate media rooms because media can be played and shared throughout the house. You can listen to a podcast in the kitchen and your spouse can listen to the same podcast in the basement. The kids can be working on homework in their bedrooms and with just your voice you can check on them and share a song or a send a reminder. Being able to play music playlists, albums, and games throughout the house means that when you’re entertaining your guests can be scattered through the house and everyone can still enjoy the same music, games, and other diversions. Wireless streaming entertainment that syncs seamlessly throughout the house will change the nature of home entertainment. For years now the open concept home has been at the top of the must-have list for parents so that they can keep an eye on their kids easily. But thanks to modern home automation parents can now watch their kids from anywhere in the house. The right team of the many available Greensboro builders can integrate artificial intelligence devices throughout the home so that your custom home will enable you to talk to your kids and see them no matter where they are in the home. You can also communicate with your spouse or anyone that is in the home from another part of the home or from your office or even driving in the car. Home automation means instant and seamless communication in all areas of the home. 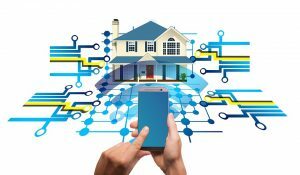 To find out more about these exciting advances in home automation and how they can make your custom home even better, call the experts at R&K Custom Homes today. Home buyers often are so caught up in the planning of their dream home that they forget that the lot matters too. The location, size of the lot, and the view from the lot will all have a big impact on how you live and how much enjoyment you get from your home. Don’t get so wrapped up in the idea of the house that you forget to notice the details of the lot. Check for things like traffic, the view, and the amount of noise around the lot to make sure you don’t end up with a great house in a bad location. Budgets are important, but when it comes to having a custom home built you should always prioritize the quality of the builder and the home over the price. The lowest priced builder is not always the best value. Remember that this is the home you’re going to be living in for years to come, so it makes sense to spend a little more money now to ensure that you are getting a home that you will love for many years and that functions the way that you need it to function. Compare the quality and reputations of the builders and not just the prices that they bid. It can take up to a year for a custom home to be built and the mortgage for the home won’t be finalized until the house is finished. Often people assume that because they have a contract for the house and the house is being built that it’s ok for them to make major purchases like new cars or other large, expensive items. Doing that will drive up your debt to income ratio and could result in you getting a higher interest rate or paying more for your mortgage. Keep your spending low until you have a mortgage and are ready to move into your new home. Thinking long term is something that many custom home buyers forget to do. You think about the features and functionality that you want in a home now instead of the features and functionality that you will need in the future. When you are designing your home, keep the future in mind. Maybe a master suite on the ground floor isn’t appealing to you now, but in ten or twenty years when it’s more difficult for you to go up and down the stairs, you might reconsider a master suite on the lower level. Think about the future when you are planning the design of your home. Too often, home buyers want to make major changes to the design of a home after the construction has started. This can drive up the cost of the home and cause large delays in completing the home. Take your time planning the home during the design phase and once the construction has started, stick to that plan. Don’t make changes after construction begins unless you absolutely have to. There are a lot of costs associated with a custom built house and the right Greensboro home builders will do their best to stay on budget. However, home buyers should always plan on a few contingencies popping up along the way that can cause delays or increases in costs. Every building project is bound to have some things that don’t go as planned and end up eating up the budget or the schedule for the new home. Smart home buyers plan for contingencies by making sure that have extra money set aside for any unexpected surprises. If you want to learn more about the common mistakes that home buyers make when they are buying a custom home and how you can avoid them, talk to one of the knowledgeable staff members at R&K Custom Homes today. Using high-quality building materials and insulation should be a given when you are working with the best home builders. The best Greensboro home builders, like Don Mills, recommend making sure that your home is being built with high-grade insulation and that everything is properly sealed. Modern high-quality windows and doors that are properly sealed and insulated will save homeowners a lot of money on heating and cooling costs. All new homes should come with Energy Star rated high-efficiency appliances including washers and dryers. When you are working with a design consultant to pick out your appliances be sure that you tell your consultant that you only want Energy Star rated appliances. Why is an Energy Star rating so important? Energy Star rated appliances have met governmental standards for energy usage and are certified to use less energy than other appliances. That means big savings for homeowners when it comes to the cost of running those appliances and it means lower greenhouse gas emissions that impact the climate. Smart home technology is a great way to make your home more energy efficient. Custom home builders can make your new home a smart home so that you can save money and have an easier time running your home. With smart home features, you can turn on the heat in your home from your phone when you leave work so that you don’t have to leave the heat running all day. Just turn it on when you’re on your way home so that it’s warm when you get home. You can also set lights and appliances on timers or turn them on individually when you need them. You can run your dishwasher or washing machine in the middle of the night to use less energy and use smart home technology in other ways to save energy and make your life easier. Overhangs at the front and side doors of your home as well as over the patio will greatly improve the energy efficiency of your home. Overhangs protect your doors and windows from the elements so that in the summer your air conditioner doesn’t have to work harder to compensate for extra sun heating up the home and in the winter your heater doesn’t have to work overtime to make up for cold air coming through the doors and windows. Well-sealed windows and doors with overhangs help create a truly energy efficient home. 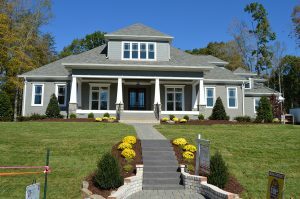 The best custom home builders in Greensboro have many options to increase energy efficiency in new homes. If energy efficiency is something that you are concerned about in your custom home, be sure to speak with one of the building experts at R&K Custom Homes today to learn more about energy efficiency options in a custom-built home. Are you embarking on the exciting journey of designing and building your very own custom home? 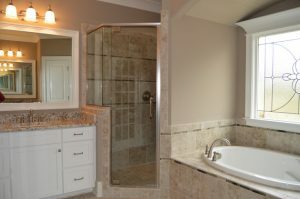 Working with Greensboro builders to create the home of your dreams is an amazingly rewarding process. When it comes to the layout of your home, one of the most important design aspects to focus on is maximizing space. There are many design elements that can be incorporated into your new home design to maximize both storage and living space. Consider the following and discuss your favorites with your builder. Plenty of windows, especially large ones, let in a lot of natural light, which makes any room seem larger. Natural light is also more efficient, meaning you won’t need as much artificial light and your energy bill will be lower. It’s important to choose well-insulated windows that won’t let in outside air or let conditioned air escape, or you won’t be saving as much energy as you thought. You can never have too much storage these days. Ample storage spaces allow for greater organization so that the rooms that are meant to be lived in can be used for their proper intention without too much clutter. Less clutter means less stress for people of all ages. So don’t skimp on the closets and built-in storage spaces. Incorporate higher ceilings in your home to make rooms feel larger without taking up any additional floor space. 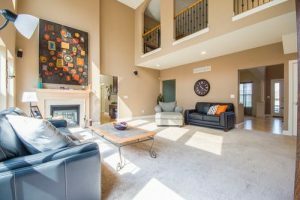 This can look like cathedral ceilings in foyers and living rooms or just 9-foot ceilings throughout the home instead of the typical 8. Intricate ceiling designs can draw visual focus upward, also creating the feel of more space in each room. When you have fewer walls separating rooms, the main living areas can feel much larger. Instead of a closed-off kitchen, living room, and dining room, the whole space can be opened up into one large room. Furniture can be used to designate the use of each part of the open space. Pocket doors where the door itself slides into the wall can save a lot of space in your home. You don’t have to design space for doors to swing out into the room. This can work well with bathroom doors, closet doors, bedroom doors, and more. The whole layout can be much easier to design by taking swinging doors out of the equation. If you want to make the most of interior space in your new custom home, discuss this with your builder. 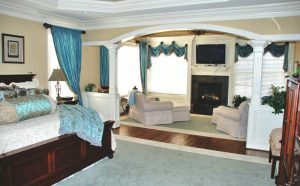 Experienced Greensboro builders, such as R&K Custom Homes, can design your home to be as space-friendly as possible so that not a single square foot is wasted. State-of-the-art design features and current technology make home layouts smarter than ever before, which are just a couple of the many benefits of building a new custom home. Call R&K Custom Homes today to get started on your space-saving home design today: (336) 643-3503.